The Tibetan studies program at Columbia is one of the leading such programs in the English-speaking world, and the first teaching program to focus on modern Tibet. Faculty include Gray Tuttle in early modern and modern Tibetan cultural history and the history of Tibetan and Chinese relations, Sonam Tsering (director of the Tibetan language program) who teaches three years of modern Tibetan, the adjunct language instructors Konchok Tseten (Tibetan medical doctor) and Pema Bhum (director of NYC’s Latse Library in Greenwich Village) who teaches second year classical Tibetan, and Lauran Hartley (Tibetan Studies librarian at the Starr East Asian library), who occasionally teaches courses on Tibetan literature. Collectively they offer a broad temporal range and a rich variety of disciplinary and methodological perspectives. The C.V. Starr East Asian Library at Columbia hosts the most comprehensive collection of Tibetological materials in the world, and is especially rich in modern journals, newspapers, and rare materials. The Modern Tibetan Studies Program based at the Weatherhead East Asian Institute plays a leading role in the study of Tibet and runs public programs aimed at the New York City area and beyond. By sponsoring lectures, workshops, films, concerts and other events on Tibet-related topics, the MTS Program works to advance academic knowledge and to deepen public understanding of Tibetan and associated issues. It also serves as a bridge between Tibetan Studies in North America and the most recent work of Tibetologists throughout the world as well as in Tibet and China through its sponsorship of visiting scholars, conferences and research. 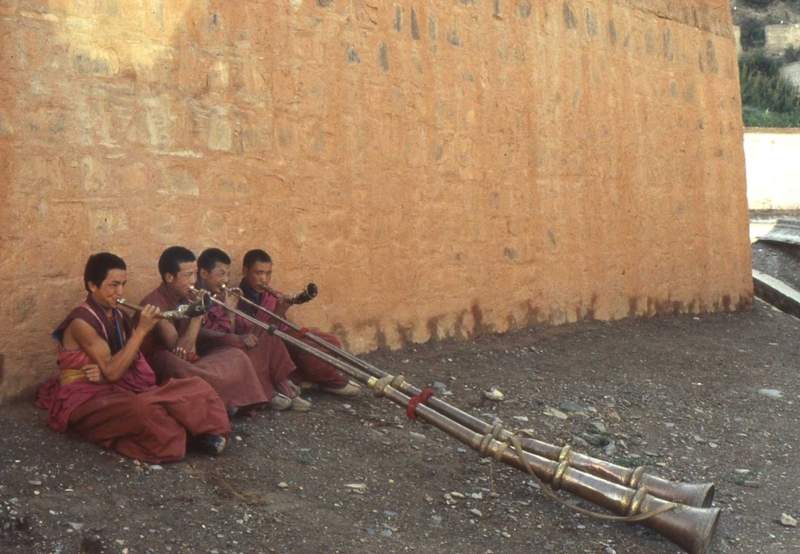 Xiahe Labrang Monastery, 1991. Photo by Gray Tuttle. Columbia’s Tibetan language program is among the best in North America, offering classes in first through third-year modern Tibetan language. Through the Department of Religion, Columbia also offers two years of classical Tibetan and advanced reading courses in classical Tibetan, mostly focused on religious texts. The Tibetan language program ranks alongside Columbia’s nationally recognized programs in Chinese, Japanese and Korean language, which together constitute one of the leading East Asian language programs in North America. Tibetan studies courses at Columbia include those on the sources of modern Tibetan history – designed especially for graduate students in Tibetan Studies – as well as on the history of China-Tibetan relations, Tibetan material history, contemporary Tibetan culture, Chinese and Tibetan film and television, oral history and biography, and other aspects of Tibetan history, culture, religion and politics. Our program encourages comparative and interdisciplinary studies and humanistic scholarship that focuses on more than a single country or a single linguistic tradition in Asia. Students frequently take seminars with professors in other programs and fields, often focusing on the history of China. For example, students combine their interest in history with material culture, gender studies, religion, or comparative literature through several joint programs. Specifically, there is an interdepartmental “History–East Asia” program, to which students may apply either through EALAC or the Department of History (applications through either department are reviewed as part of the same pool), a joint Concentration Program of the Institute of Comparative Literature and Society. In terms of temporal coverage, Tibetan Studies at Columbia University covers the early modern, modern and contemporary periods (17th to 21st centuries). We emphasize a transnational approach to Tibetan studies, with a focus on the disciplines of history and religion. Students thus work with a range of faculty at Columbia. Our strong Chinese history program features Madeleine Zelin in modern economic and institutional history, Eugenia Lean in modern cultural history, Dorothy Ko in Ming-Qing cultural history and material history, and Li Feng in early history and archaeology. We are just as rich in Chinese literature, with Lydia Liu in modern literature and theory and Shang Wei in Ming-Qing fiction and drama. We have the leading faculty in East Asian religion in this country with Bernard Faure, Max Moerman, and Michael Como in Japanese religions. We also have great depth on the Japan side, with Carol Gluck, Paul Kreitman, Gregory Pflugfelder, and David Lurie in history, Tomi Suzuki, and Haruo Shirane in literature, and Paul Anderer in Japanese film and visual culture. Columbia’s location in New York City, home to the largest Tibetan community outside of Asia, provides students with a wealth of Tibet-related academic and cultural activities. Students can take advantage of Tibet-related talks, film screenings, exhibitions, and other activities at the Rubin Museum of Art, Trace Foundation’s Latse Contemporary Tibetan Library, Tibet House, the Jacques Marchais Museum, and Asia Society, as well as at the Lincoln Center, the Metropolitan Museum of Art, the Museum of Modern Art, American Museum of Natural History and the New York Public Library. Students in the PhD program at Columbia engage in cutting-edge research on a wide array of topics. Please see the list of recent graduates and their dissertation topics as well as the current PhD student profiles. The PhD program provides full funding (covering both tuition and stipend) for five years. The Tibetan studies MA program has an excellent record of placing its graduates in PhD programs of high quality (including Harvard, Yale, Chicago) or in non-academic jobs related to East Asia; it is a good beginning to either an academic or a professional career. Please contact Tibetan studies faculty by email to learn more about the PhD and MA programs.